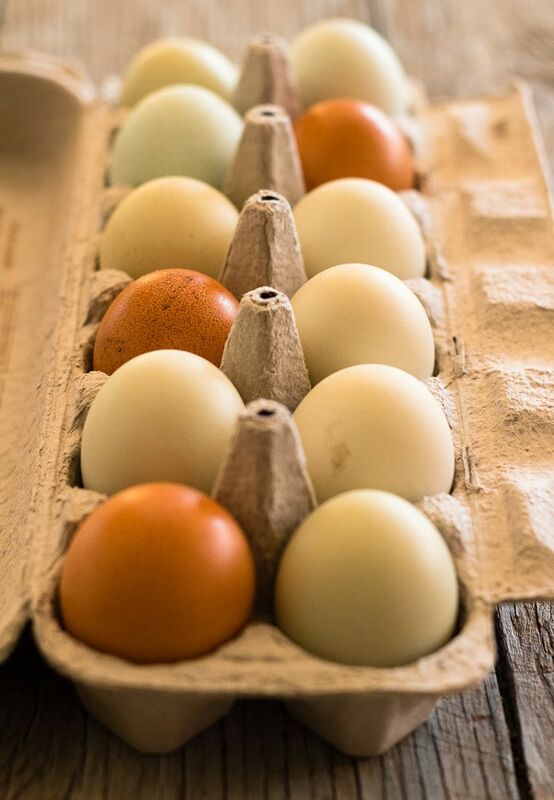 If you have eggs and leafy greens on hand, you have the beginnings of an easy and quick supper. 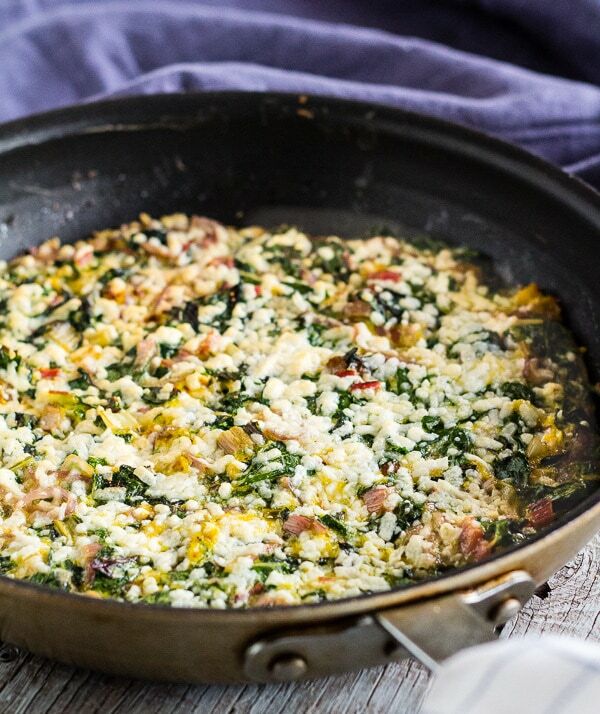 Take for example, this rainbow chard frittata. Seasoned simply, with aromatic onions and garlic, plus salt and pepper, frittatas like this are a protein rich last minute meal, one I fall back on time and time again. Nutritious rainbow chard is the leafy green in this frittata. 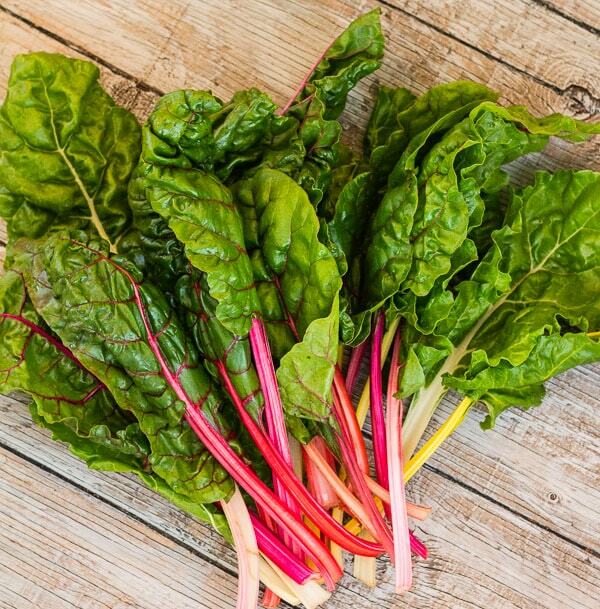 The best thing about using chard is that you can–you should–you must–use the colorful stalks as well as the leaves. The stalks add bonus flavor and color plus more vegetable volume to whatever you’re using it in, like frittatas! Think of a frittata as a large Italian omelet, except the filling is mixed right into the eggs. 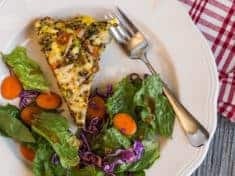 Almost any vegetable goes—potatoes, asparagus, all types of greens, leftovers–rainbow chard frittata is just one idea. If you have fresh herbs, include them. You can add cheese or skip the cheese altogether. Vary your rainbow chard frittata with Gruyere, blue, feta, ricotta, whatever you have on hand. Mix it in the filling or/and sprinkle the cheese on top. Frittatas can be made with up to a dozen eggs–this one is veggie dominant, made with 6 eggs. You can bake the whole thing in the oven, or cook it stovetop. Some recipes have you flip a frittata onto a plate and slide it back into the skillet to cook the other side. This rainbow chard frittata finishes under the broiler—no flipping skills needed. 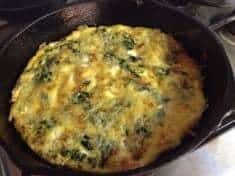 The first time I made a chard frittata was with friends in Hood River Oregon. Actually they were catering a wedding and I was there to help. For 3 hours I cracked eggs while my frittata partner cooked the eggs and veggies, skillet after skillet, 20 frittatas total. They were served on large family style platters, 12 wedges to a platter, surrounded with mixed greens, sliced red and yellow beets, and local goat cheese. We followed a frittata recipe from The Art of Simple Food: Notes, Lessons, and Recipes from a Delicious Revolution, a cookbook by Alice Waters. The recipe includes numerous tips for making perfect frittatas, with variations and serving ideas. I ordered the cookbook the next day, and have been making frittatas ever since. 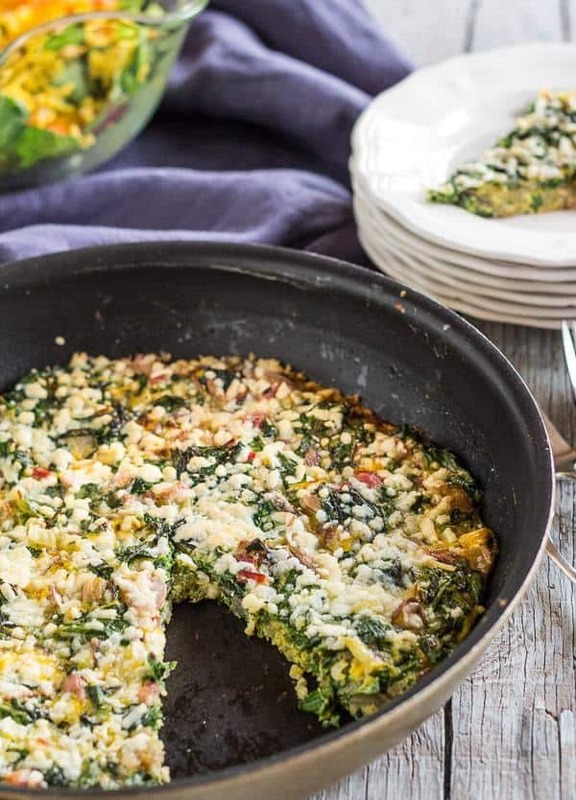 This rainbow chard frittata is adapted from that original recipe. Crinkly-leafed chard is also known as Swiss chard. The gold, red, and white rainbow stalks look a bit like rhubarb or celery, though chard is a botanical cousin of beets and spinach, and, surprisingly, quinoa! Like spinach, chard’s tender leaves wilt and shrink quickly, all the sooner to get your frittata cooking. Chard is second only to spinach on the world’s healthiest vegetable list. It’s packed with anthocyanins and fiber, and its vidid color, both in leaves and stalks, illustrates chard’s antioxidant qualities. Alice Water’s recipe calls for a 10-inch non-stick skillet. Robbie and I like a relatively thin frittata, so I make ours in a 12-inch skillet. I cook frittatas in either a cast iron or non-stick skillet, depending on my mood. For more inspiration from Alice Waters: The Art of Simple Food II: Recipes, Flavor, and Inspiration from the New Kitchen Garden. 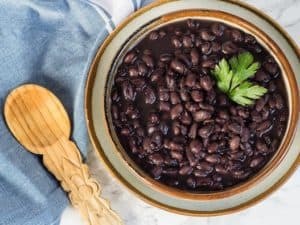 You might also want to try this Spicy Instant Pot Chard and Pinto Bean Risotto. Or Chard Enchiladas. Wishing you a fabulous week–get in the kitchen and cook something quick and easy, like a veggie frittata! 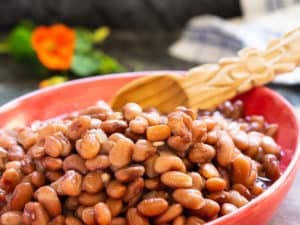 Here's an easy, protein-rich meal with limitless variations. 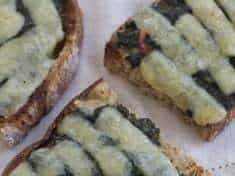 Follow this basic recipe and swap in different vegetables, and or cheese, whatever you have on hand. Makes one 10-or 12-inch skillet. Serves 8 to 12. Heat the first tablespoon of oil in a skillet. Add the onion and chard stalks and sauté about 5 minutes, until the onion is translucent. Add the garlic and cook another 4 to 5 minutes. Stir in the chard leaves, season with salt, and cook until the leaves are wilted and tender, about 5 more minutes. Remove from the skillet and let cool. Pre-heat a clean 10- or 12-inch skillet over medium low heat. (see note) Also pre-heat the oven broiler. Pour the remaining 2 tablespoons of olive oil into the skillet. After a few seconds, pour in the egg and chard mixture. As the eggs set on the bottom, gently lift the edges to allow the uncooked egg to flow underneath. Continue to cook until mostly set, but a little runny on top. Sprinkle the cheese, if using, over the eggs. Place under the broiler 3 to 4 minutes, until the cheese is golden and the eggs are set. 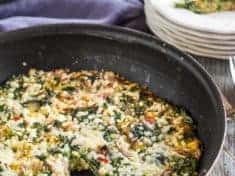 **This rainbow chard frittata is an update of a recipe I wrote for my CSA back in 2009, and migrated over from my old Muffin Talk blog. The post never included photos, until now! « Vegetables: Inspired Recipes and Tips—a Martha Stewart cookbook.